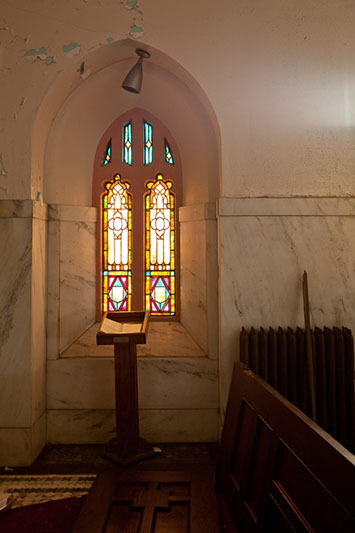 The origins of what would become Woodward Avenue’s most distinctive and unique churches had a very modest beginning in the basement of the home of Richard Owen on Alger Street on June 25th, 1907. A meeting was held by a group of residents to address the growing number of Presbyterian families moving into the area who did not regularly attend church because the lack of one nearby. 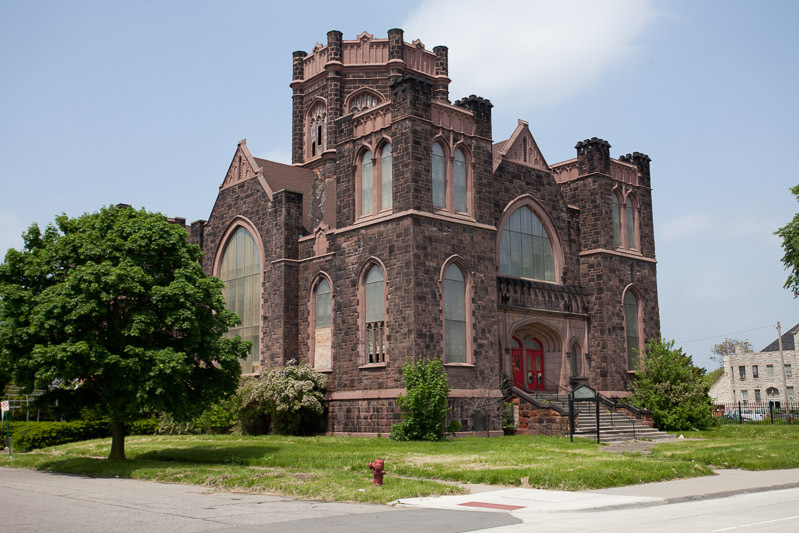 The “North Woodward Presbyterian Committee” found that they were 260 families in the area, numbering around 1,000 individuals that could be served by construction of a new church. It was resolved at this meeting to establish such a church, the plan for which was approved by the Presbytery a few months later. 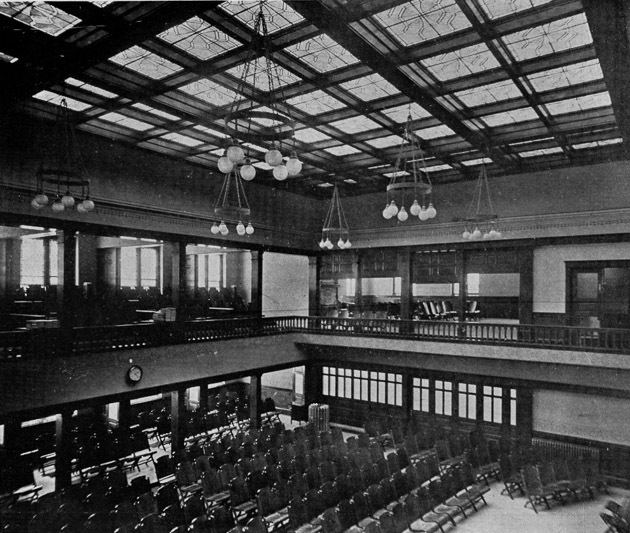 The first meeting of public worship of the new church was held in November in the auditorium of a nearby church, attended by 150. 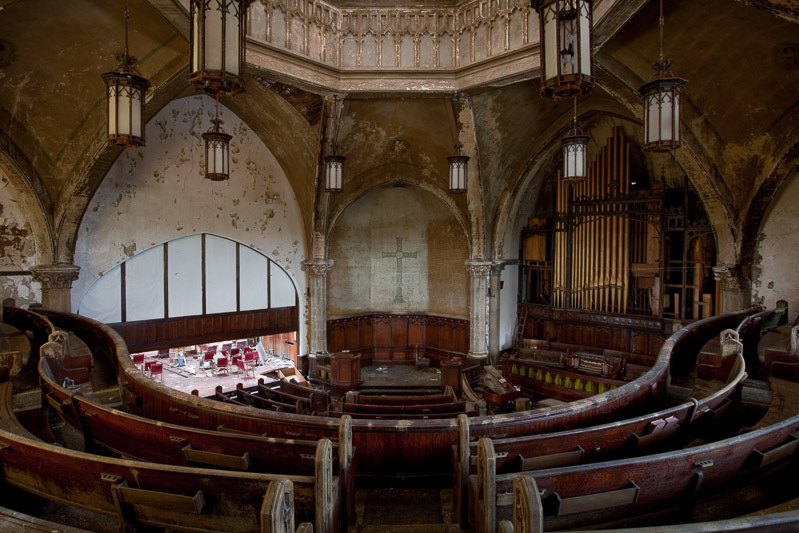 Enthusiasm for the new church ran high, and within a short time wealthy church patron Mrs. Tracy McGregor donated a parcel of land on the corner of Woodward and Philadelphia Streets. The Rev. Sherman L. Divine of the Presbyterian Church of Marinette, WI was installed as the first pastor in November of 1908. 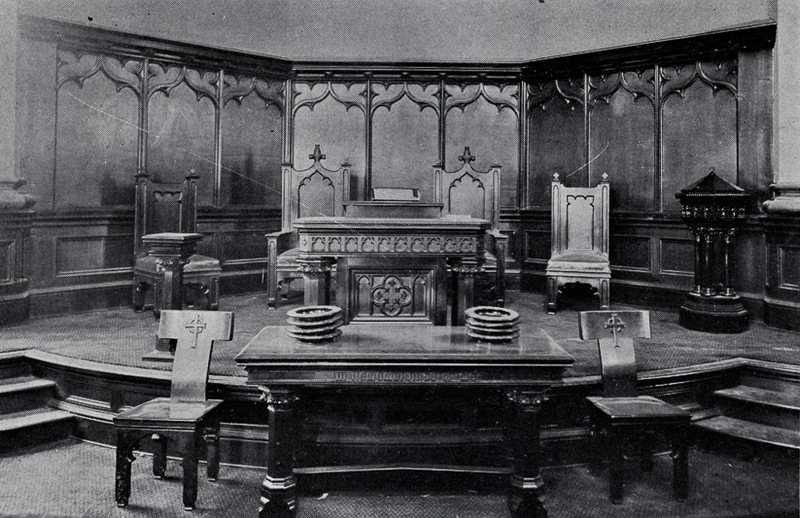 As services were held in nearby churches and halls, Divine and the elders of the church enlisted the firm of Sidney Rose Badgley and William Nicklas to design the church edifice. Budget for construction of church was $100,000, or about $2.4M in 2010 dollars, a vast amount of money for the time – and today. 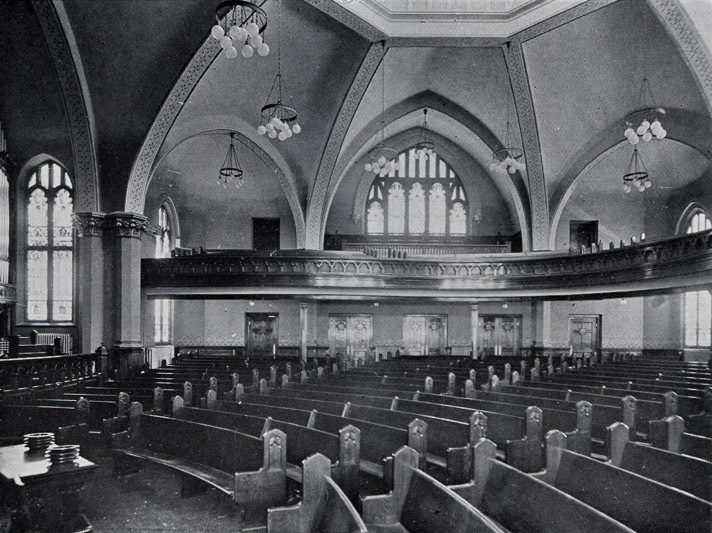 By January of 1909 the membership of the church had grown to 325, holding services in different rented spaces as the congregation gained members. 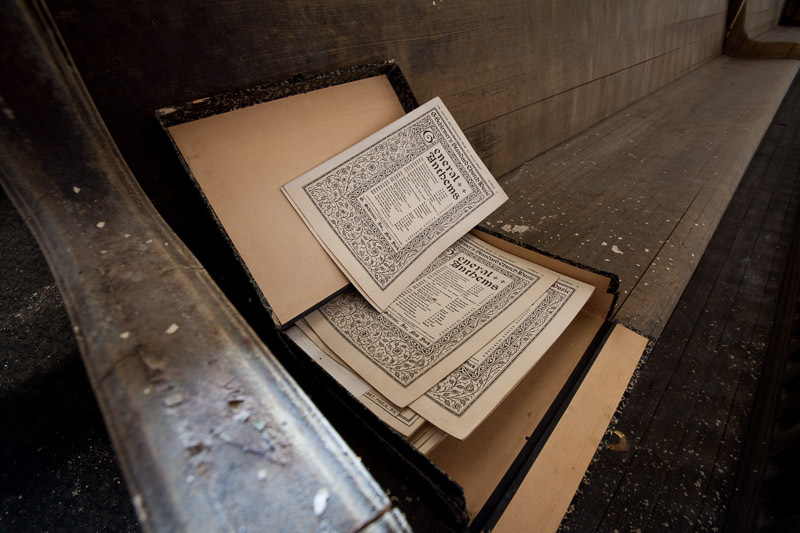 As the cornerstone for the new church as laid in a ceremony on January 1st, 1910, the church numbered 742 members. 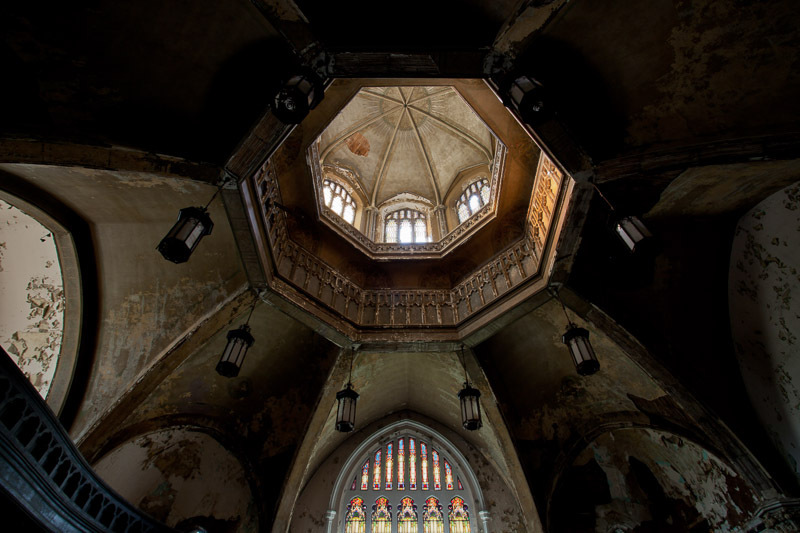 What rose along Woodward Avenue over 1909 to 1911 was a masterpiece of modern English Gothic design: Two square towers flanking a gabled entrance of carved stone, with the octagonal sanctuary rising up behind to a lantern-style dome of stained glass and stone at the center. 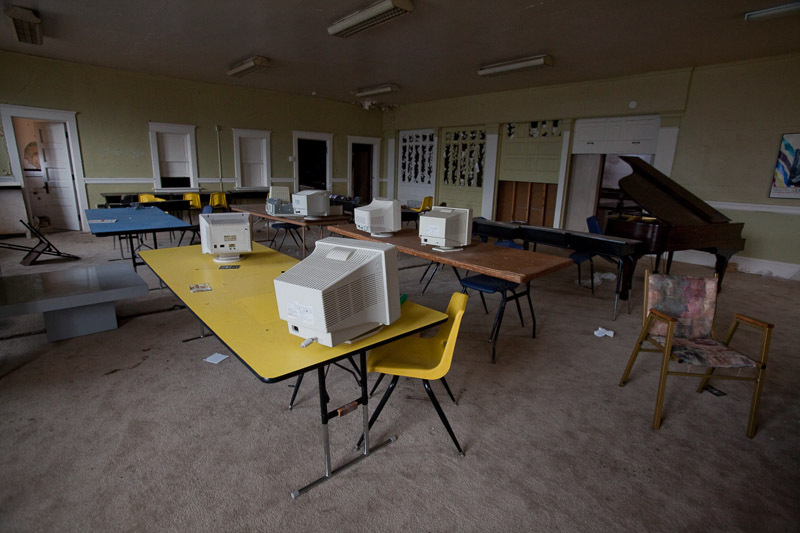 At the rear was the Sunday school wing, with classrooms and recreational facilities. The exterior of rock-faced brownstone quarried in Polk County, PA has a rough, hewn look to it, contrasting with the smooth limestone trim. 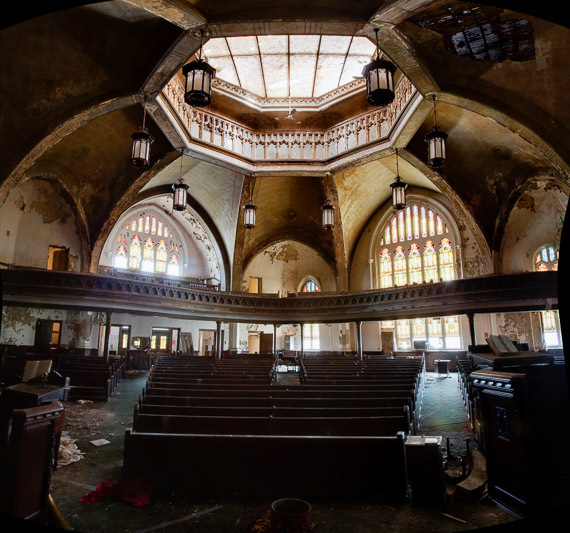 Inside the arched sanctuary, curving wood pews were arranged in a fan shape around the altar, with a matching balcony sweeping around the rear. 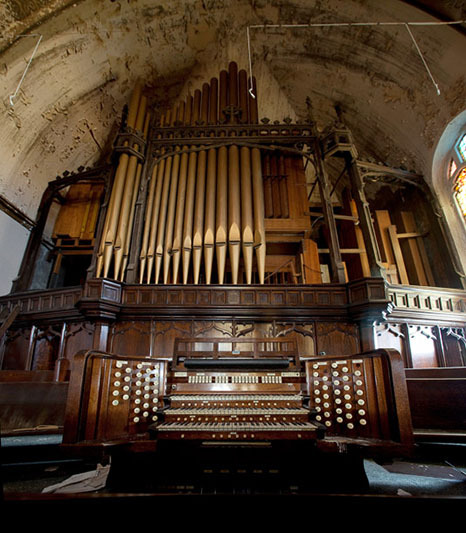 The massive pipe organ, also donated by Mrs. Tracy McGregor, was built by the Stevens Organ Company of Marietta, Ohio. 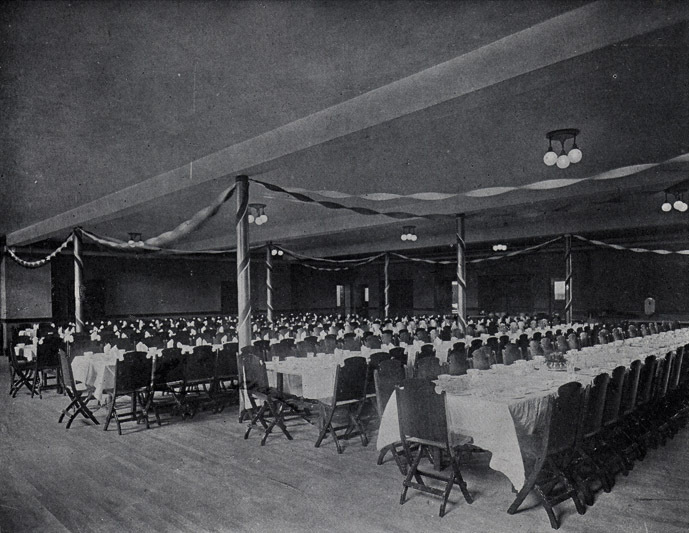 These essential functions included recreational facilities, including a basketball court and multi-lane bowling alley, and space for social functions in the spacious basement banquet hall and classrooms above. 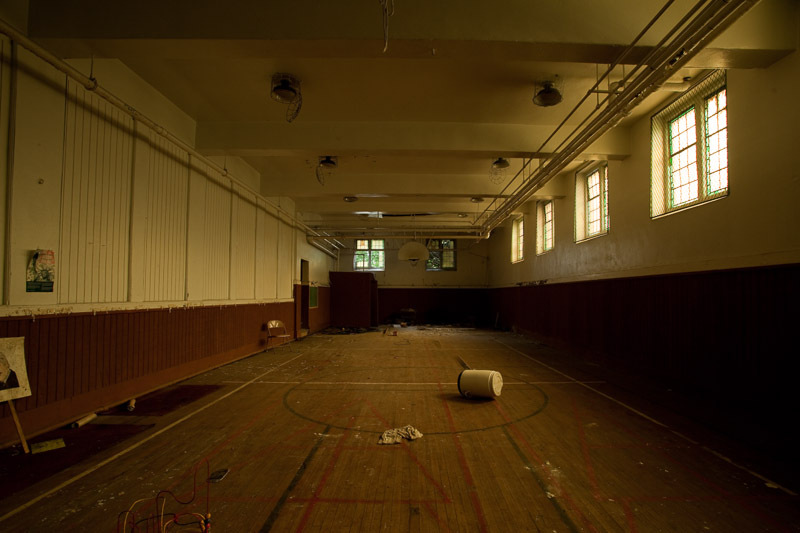 In its early years the church was open seven days a week, so as to make it available to the young people of the neighborhood, giving them a place to meet and play sports. 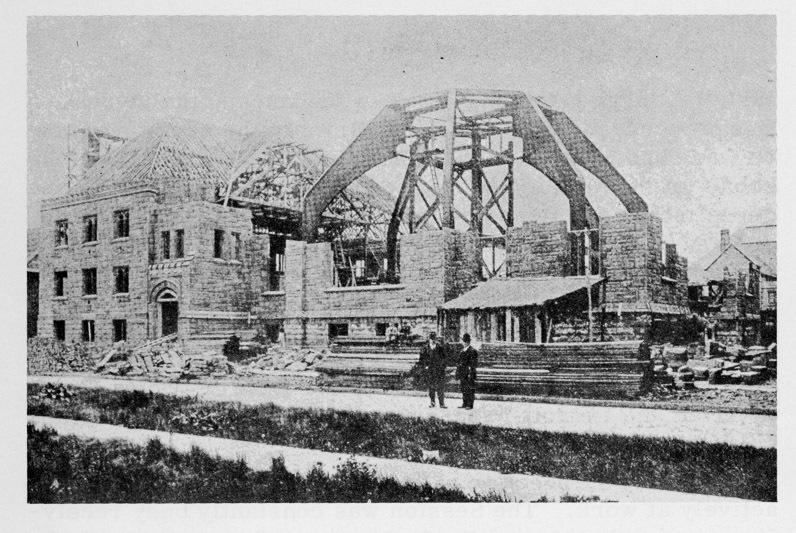 The dedication of the church on June 25th, 1911 was a celebrated occasion, attended by city officials and members of nearby churches. 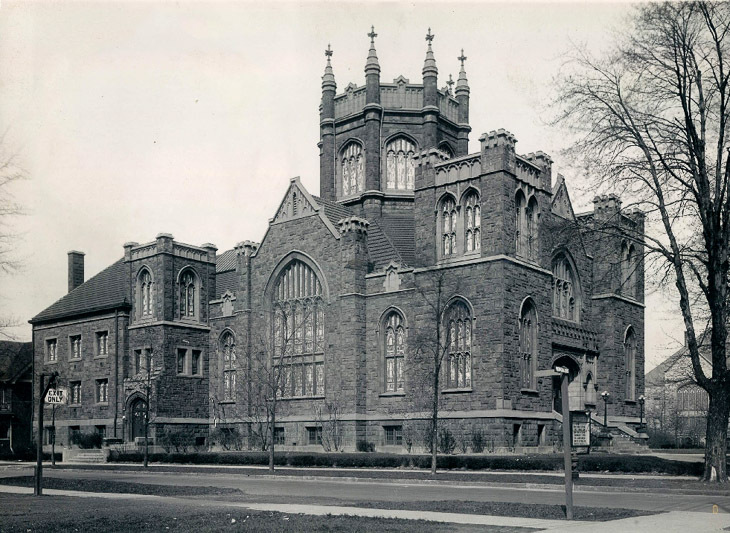 The Detroit Times marveled at the new church, declaring “in its completed state today stands as one of the handsomest churches in the country.” The momentum carried through 1912, as the eloquent sermons of Rev. Divine drew membership up to 1,000 by March of that year, and to 1,500 by 1913. 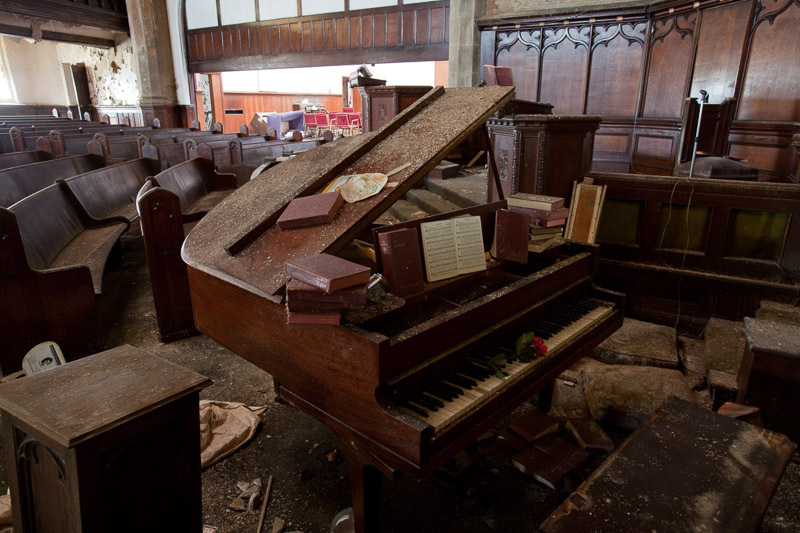 But Reverend Divine would not occupy the pulpit for long; he would resign after being accused of “indiscreet conduct” with a married member of the church choir. Rumors and gossip swirled as “the singer was seen to visit the pastors study more than what would deemed an ordinary number of times.” An investigation demanded by the husband cleared the reverend of any serious misconduct, and while the majority of the 1,500 members of the church supported him, he stepped down in September. Reverend W. H. Wray Boyle, from a Presbyterian Church in a suburb of Chicago, took over the post of leader in 1914. Church history recalls him as a great orator, expanding the church membership by aggressively courting new members throughout the community. Around this time a mission was established in Highland Park. 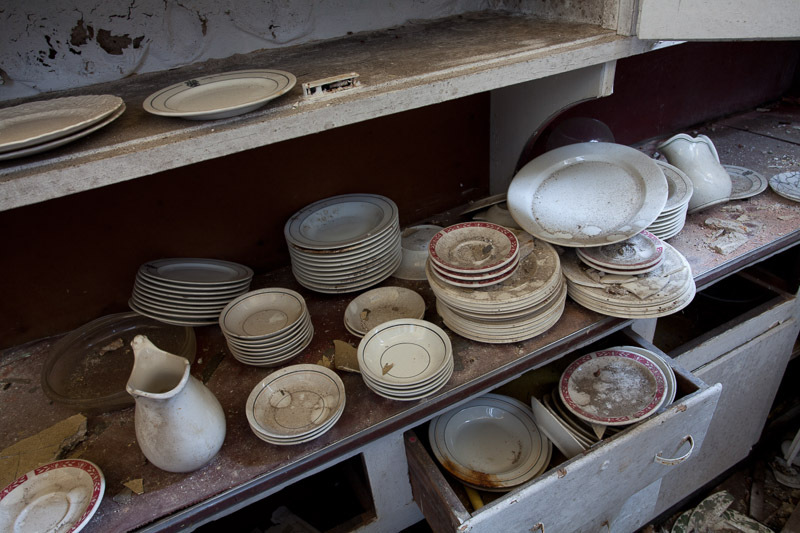 Boyle did not remain long, however, and left the church in 1917 to care for a son who suffered from chronic illnesses. Within weeks of the US entering the First World War, the church selected Reverend Joseph W. Cochran, who had led churches in Wisconsin and Philadelphia. The fight in Europe would dominate church interests for the next few years, as members left to serve and those at home felt the pinch of rationing. Shortages in coal forced to church to close its doors for all but two days a week. A company of militia formed from the congregation drills for months on the playground next door, while the Red Cross auxiliary trained and raised funds for the war effort. 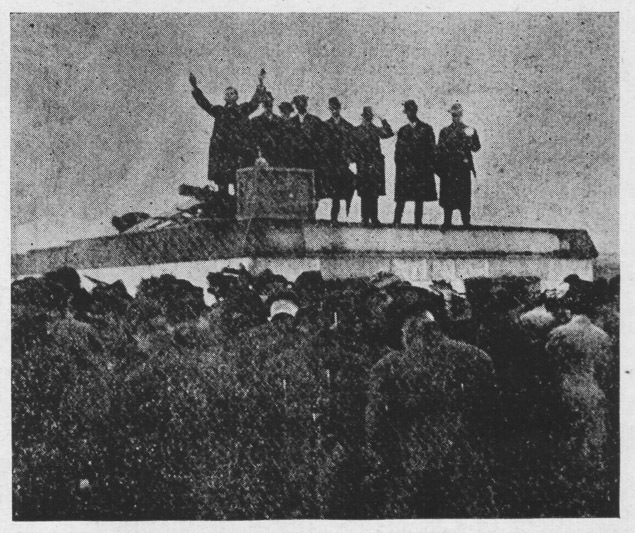 Eventually Reverend Cochran heeded a request by the Army for more chaplains, and in 1919 took a six-month leave of absence to travel to Europe. In all, 204 members of the church served overseas, with five giving their lives. A bronze memorial tablet was dedicated in their honor. 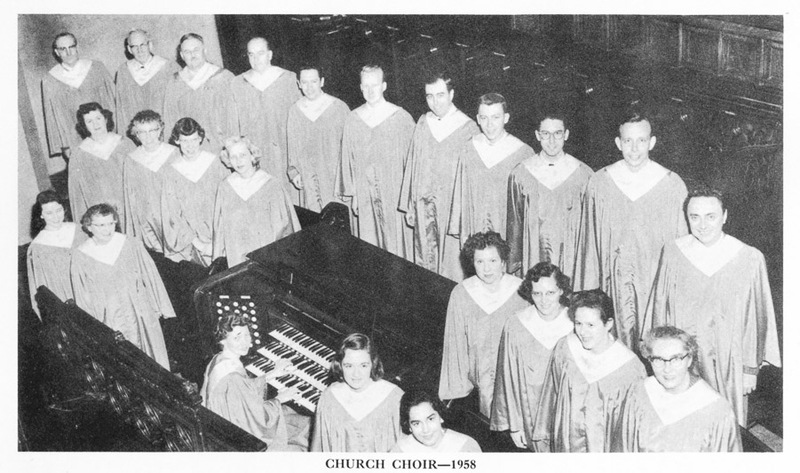 The end of the war and the roaring 20’s saw the church grow in many different ways. In 1921 the Church established an agricultural and educational mission in Moga, India, serving the lower caste members who were shunned by the rest of the community. By 1924 the church had an active athletic league, with bowling, tennis, basketball, baseball, and golf teams. Membership continued to rise, reaching 2,000 by 1931. 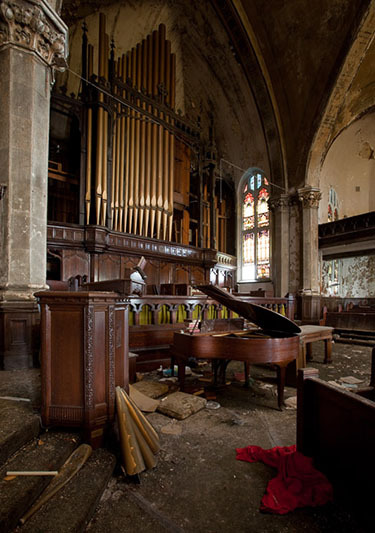 In 1937, the church embarked on a fundraising effort to support repair work on the church exterior, the condition of which was, in the words of church members, “frankly, shabby.” The repairs also extended to the inside of the building, repairing the sanctuary, altar, and pipe organ. 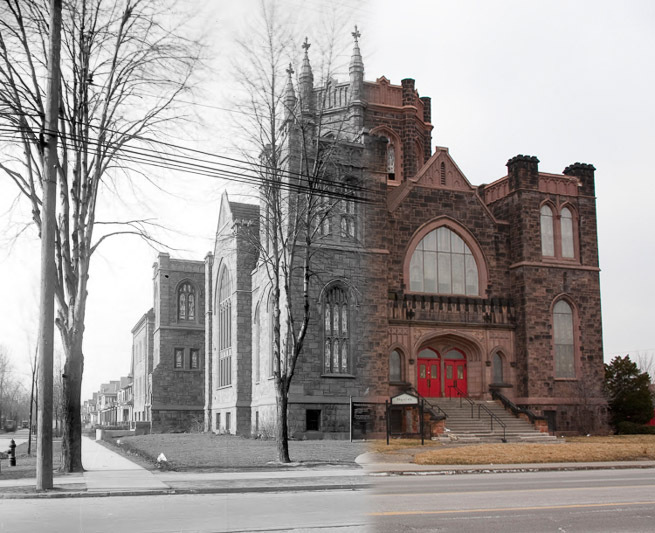 Like other nearby churches, Woodward Avenue Presbyterian weathered the changing social and economic conditions of the city through the 1950’s. Many of its members started moving to the suburbs during that time, joining the larger “white flight.” By 1958, the fiftieth anniversary of the church, the number of members had fallen to half of its peak, numbering around 1,100. 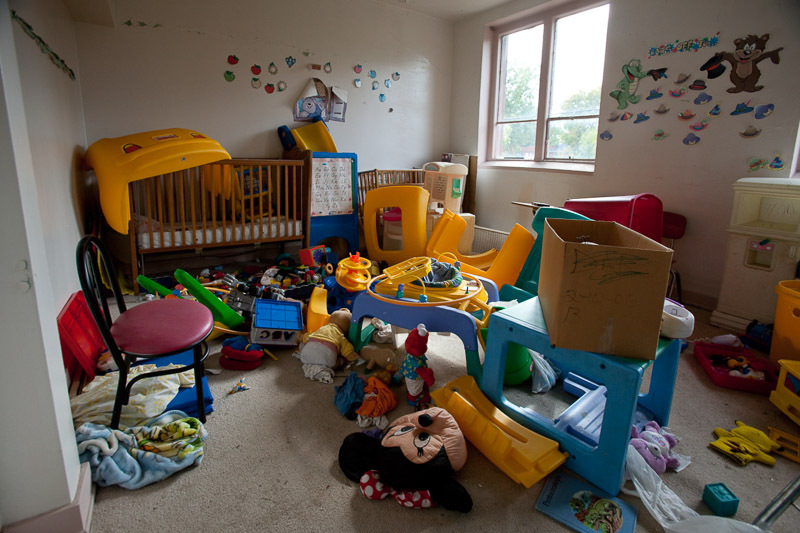 The neighborhood around the church started to change, with more black families moving in, and while the Presbyterian Church continued outreach efforts to gain new members, the rather stuffy and old style of worship did not appeal to the new arrivals. 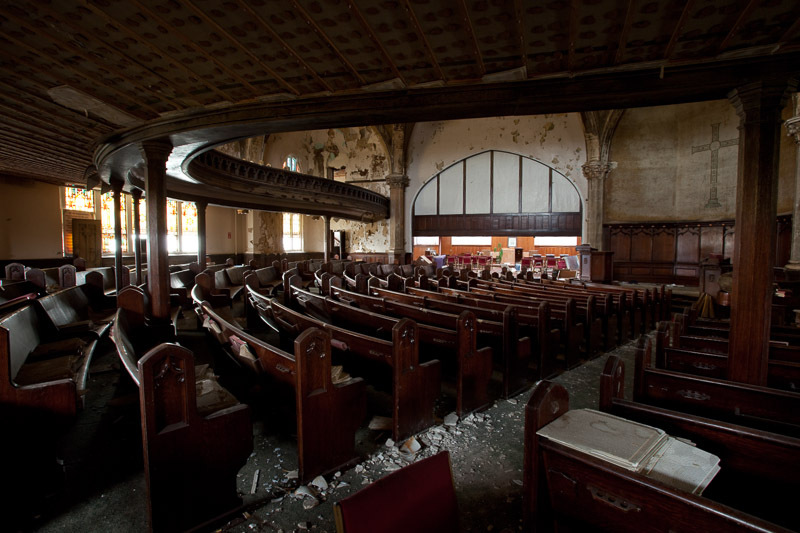 The church continued to shrink through the 60’s and 70’s, falling to 404 by 1971. 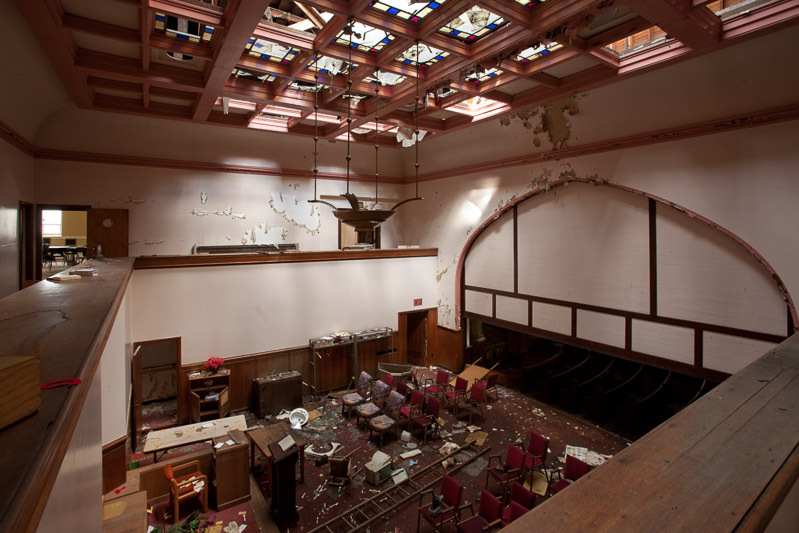 In an effort to save the church, in 1981 Woodward Avenue merged with The Church of The Covenant, another struggling Presbyterian Church on the east side of the city. The combined congregation moved to Woodward, and the pastor of Covenant, Gary M. Douglas, took over leadership of the church. Even this effort did little to raise the fortunes of the church, which continued to lose members after the merger. 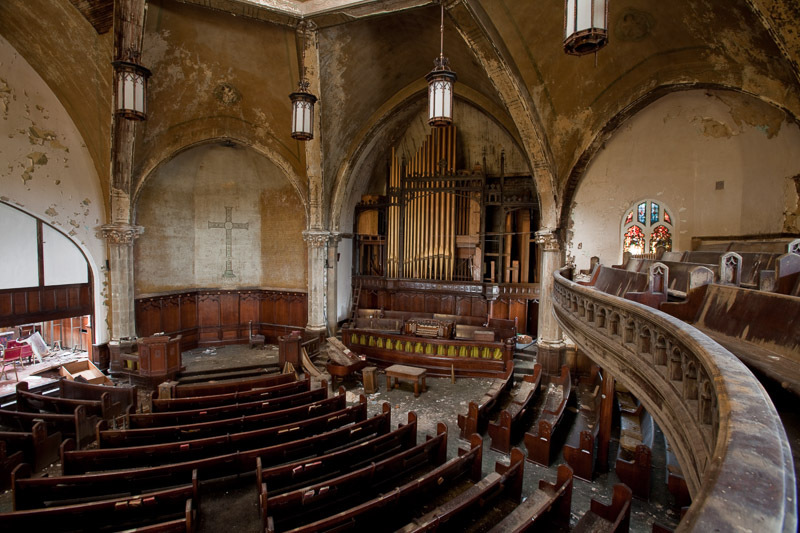 1993 was the last year of Woodward Avenue Presbyterian, as Reverend Douglas sought and obtained permission to withdraw from the Detroit Presbytery. 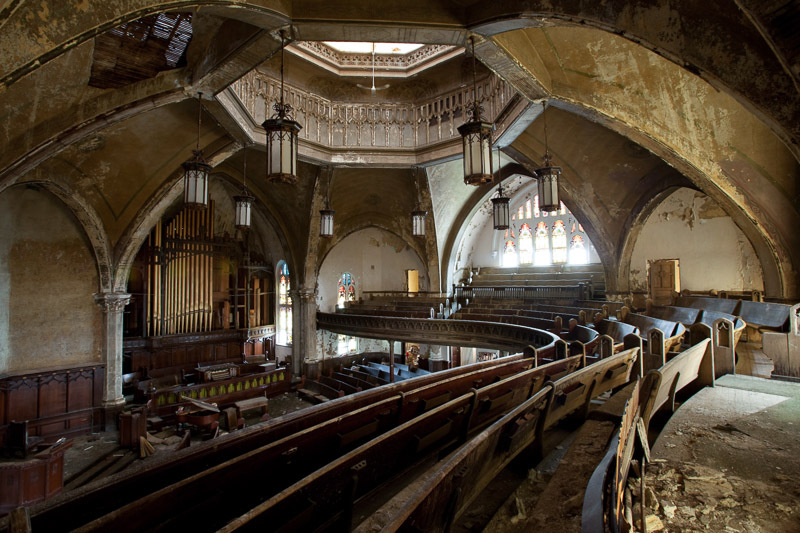 Over time his teachings and style of worship had shifted closer to that of Baptist, and after negotiating a deal that saw him take over the building and property, he renamed it Abyssinia Interdenominational Church. The church continued on but never attracted enough members to offset the cost of operating and maintaining such a large, old church building. Douglas died in 2005, and with him, Abyssinia Church too. 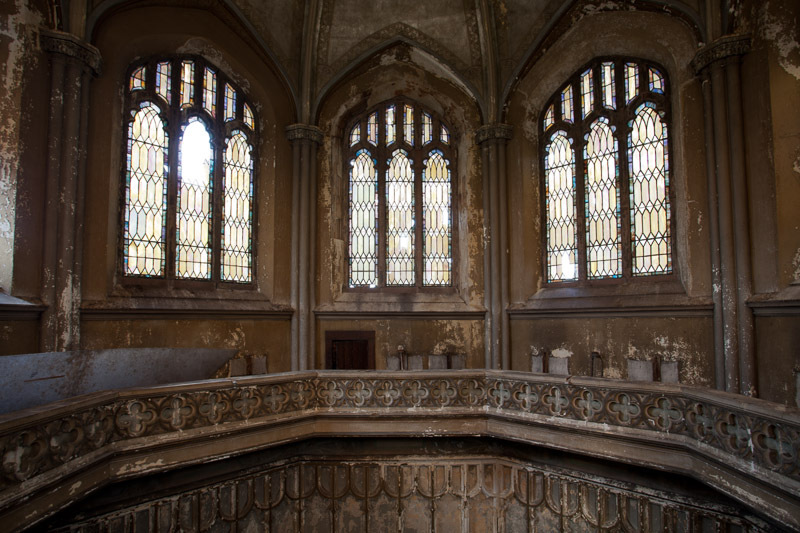 Since then the former Woodward Avenue Presbyterian building has been in a state of limbo, shifting from one owner to another as plans to renovate have fallen through. 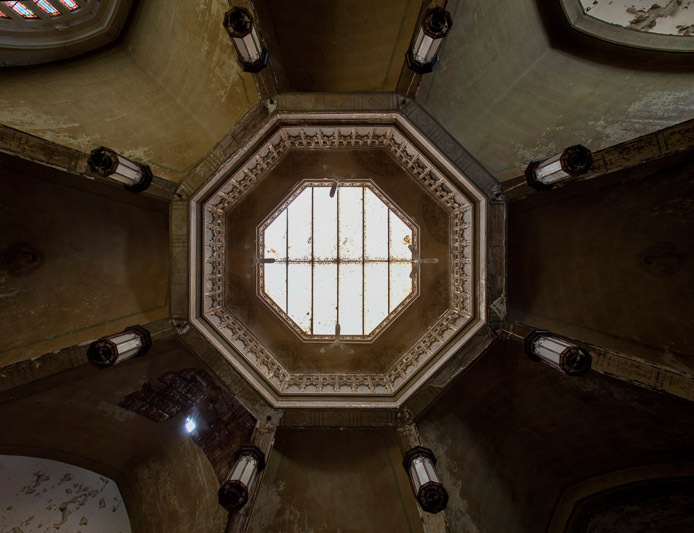 According to Historicdetroit.org, a court battle over the estate of Reverend Douglas left the building vacant and deteriorating, as scrappers and natural elements took their toll on the 100-year-old structure. 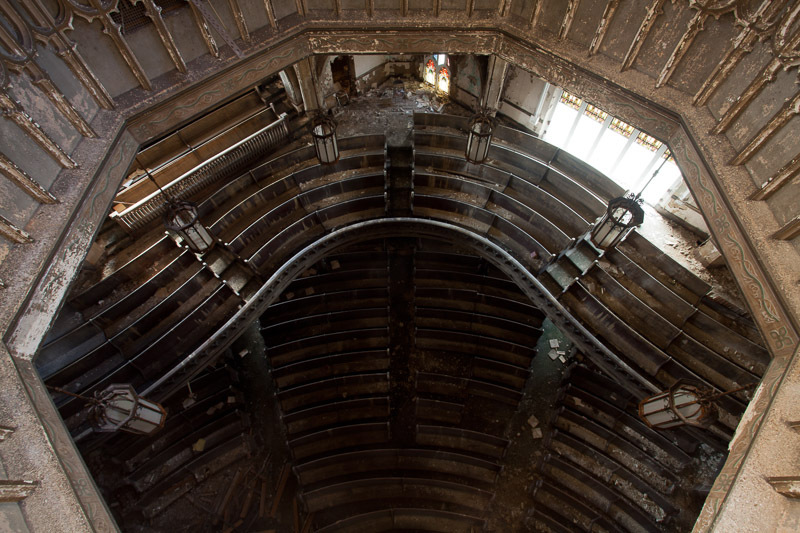 The organ pipes were scrapped in 2009, along with much of the remaining metal. 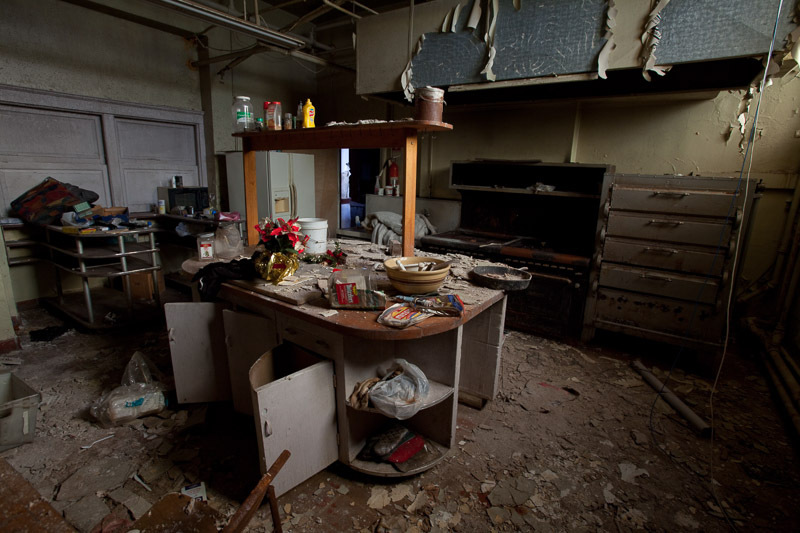 In 2009 the building was purchased by Cathedral of Praise Baptist Church, but the cost of restoring the building proved to be too high, and it has sat vacant since. Most recently a tax foreclosure notice appeared on the door, indicating that the church might end up at auction in the near future. 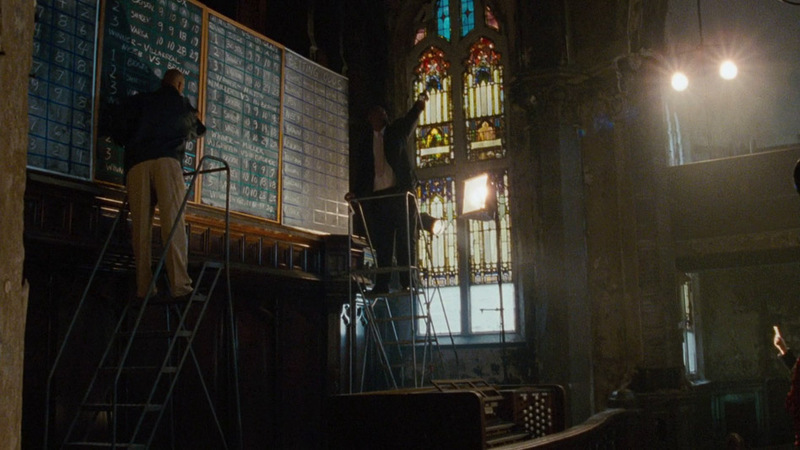 Over the summer of 2011, the church was used as a set for the movie “Alex Cross.” In preparation for shooting, much of the debris was cleared out of the building, and the pews were moved to make way for a boxing ring built in the center. 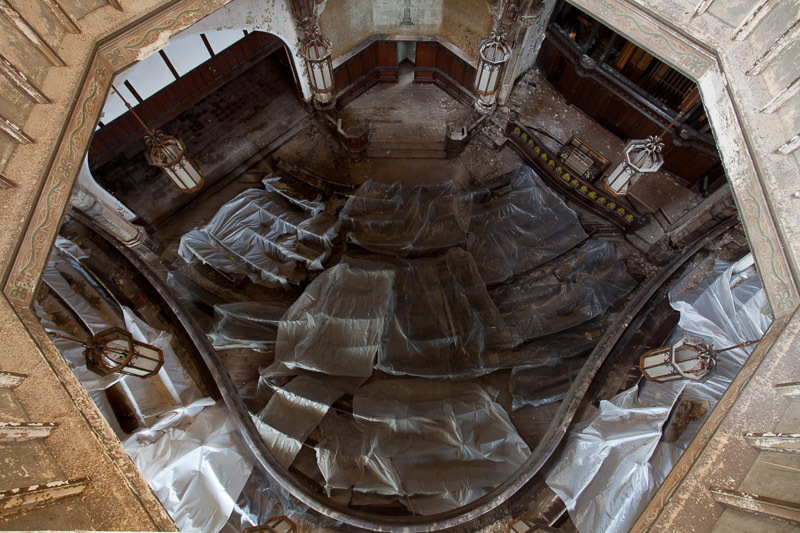 After shooting wrapped, the pews were put back – albeit slightly haphazardly – and covered with a plastic tarp. The church was re-secured with steel panels over many of the entrances. 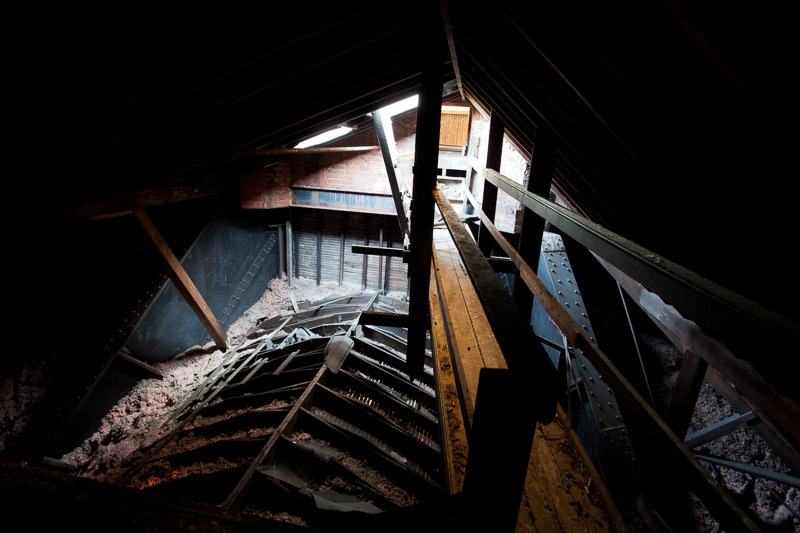 In the fall of 2014, workers began repairing the roof and gutting the interior of the church in preparation for renovation, though few details are available.